Two days ago a reader asked this question about the building behind the Slushy Stand: "how long has that been there and what is it?" The reader went on to comment that newer buildings and other structures have crowded out many views around the harbor. This area is a prime example. This photo was taken from the edge of Silver Lake, on the corner where Ride the Wind stores its kayaks. The road on the left (NC12 South) leads past the Community Square to the Swan Quarter and Cedar Island ferries. Proceeding around the corner on the right (NC 12 North) the road passes Spencer's Market on the way to Hatteras Inlet. The large area of green in front of the house in the center is where the Slushy Stand is today. To the right, around the corner on NC12, is the location of the Island Ragpicker. 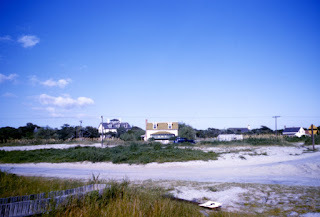 The house in question (with two dormers) was the home of Murray Tolson and his wife Elsie. Elsie, my father's first cousin, was the daughter of Rev. Lawrence Olin Wyche and Lorena Howard (and granddaughter of Capt. James W. Howard, keeper of the Cedar Hammock Life Saving Station). Elsie was also the sister of Major General Ira Thomas Wyche (you can read his story here: http://www.villagecraftsmen.com/news092110.htm). After Cousin Elsie died the house was sold. For a while it was used as a bed and breakfast. At one time it was connected to the Island Ragpicker. 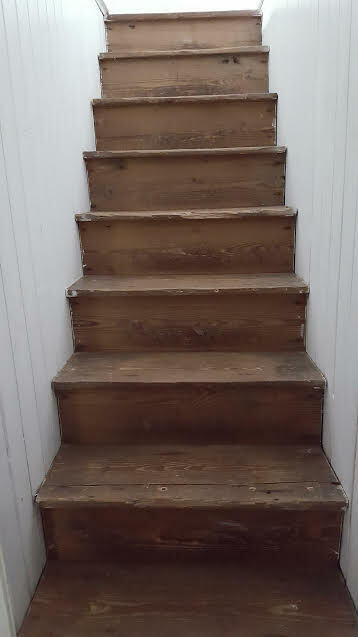 Today it is a year-round rental house, accessible via a sandy driveway from Lawton Lane. The state of emergency for all of Hyde County and mandatory visitor evacuation of Ocracoke Island has been lifted. This morning NCDOT officials confirmed that road conditions were acceptable for travel and the NCDOT Ferry Division operated a successful test run. 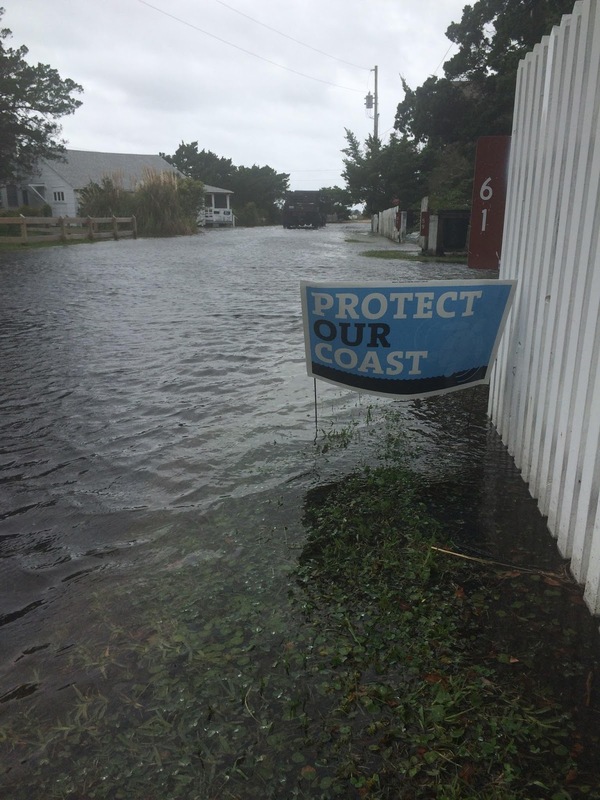 Based on that information, the Ocracoke Deputy Control Group recommended that the visitor evacuation order be canceled. The Hyde County Board of Commissioners immediately called for a vote and issued a proclamation lifting the state of emergency and visitor evacuation order. 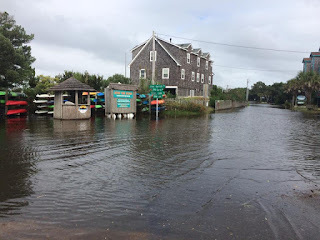 The Cedar Island and Swan Quarter ferry routes will resume scheduled service immediately, while the Hatteras route will resume service at 1 pm, when Hatteras Island reopens to visitors. Visitors coming via Hatteras will not be allowed past the Bonner Bridge checkpoint until Dare County's evacuation order is lifted at 1 pm. 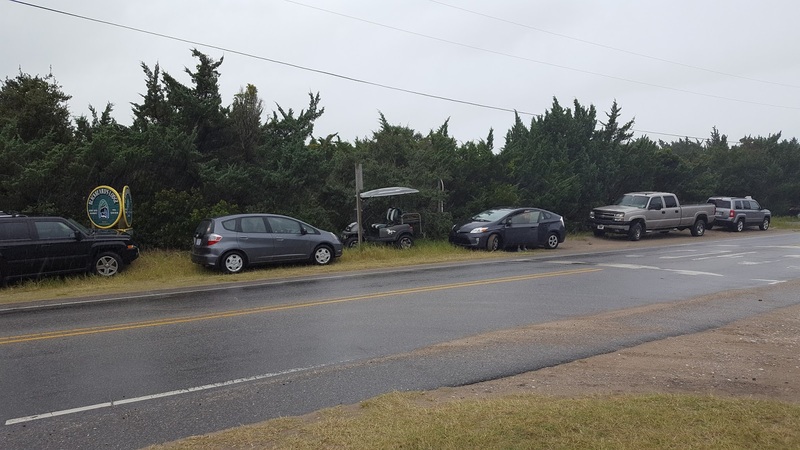 Visitors returning to Ocracoke should be aware that there will be some areas of standing water on the roadways and drive very cautiously. Additionally, saltwater can cause damage to vehicles. The threat of dangerous surf and strong rip currents is very high along the beaches of Outer Banks and they are expected to persist throughout the weekend. 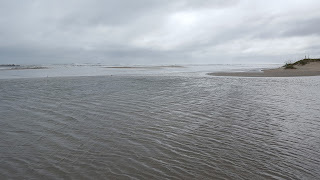 Individuals visiting the beaches of Ocracoke need to be aware that National Park Service lifeguard services have ended for the season and be extremely careful if you are planning on entering the water. If caught in a rip current remain calm. Don't fight the current. Swim in a direction following the shoreline. When out of the current, swim back to shore. If tired, float or tread water until out of the rip current. If you are unable to escape, face the shore and call or wave for help. Shore break occurs when waves break directly on the beach. The most common injuries associated with strong shore break are neck and back injuries, which most often occur when the powerful surf throws a swimmer or surfer head first into the bottom. It is extremely important to protect your head and neck whenever you are in breaking waves by keeping your hands in front of you at all times. Hurricane Maria's winds and tides are moving out to sea. Today's post is about another storm, the 1846 hurricane that opened Hatteras and Oregon Inlets. All of the inlets along the Outer Banks are periodically changing...all but one, that is. 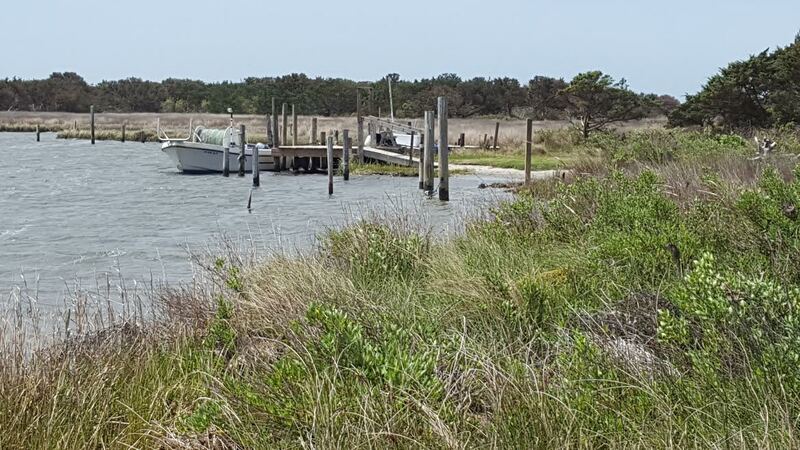 Ocracoke Inlet has been continuously open since Europeans began keeping records. 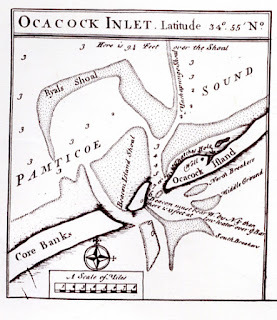 Before 1764 Ocracoke and Hatteras islands were separated by Old Hatteras Inlet, about 8 miles northeast of Ocracoke village (about 2 miles northeast of the pony pen). Old Hatteras Inlet closed in 1764, thereby joining Hatteras and Ocracoke islands, making it possible to travel by foot or pony cart between the settlements. On September 7, 1846, a violent hurricane opened the present Hatteras Inlet, again separating Ocracoke and Hatteras. This almost doubled the length of Ocracoke, which is today about 16 miles long. Local island lore reports that in 1846 Caroline Williams Howard walked from Hatteras to Ocracoke "on dry foot." She was carrying her stepson Robert (1845-1878), and is believed to be the last person to walk across what is now Hatteras Inlet. Blue skies over Lawton Lane this morning! A lifting of the evacuation order can't be too far behind! Although the tide came up over the roads in several places in the village yesterday, we were spared at Village Craftsmen on Howard Street. It is still cloudy and windy this morning, but we are looking forward to sunny weather tomorrow. You can see more photos and a video on our Facebook page. A reader posted this question yesterday, "I am not up on computers that much but why is it easier to post things on facebook than on here?? I went on face book once and I was bombarded by ads and junk for weeks. I rather read your posts here-it seems safer." 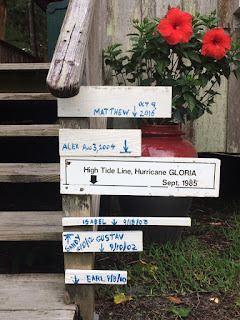 In the early days of this blog I did my best to keep our readers informed of conditions before, during, and after hurricanes and storms. It was often the best source of information for folks off the island. Several years ago it became apparent that Facebook was a better source for up-to-date storm news. The reason for this is networking. I could only post photos I had taken in my neighborhood. To get a broader perspective I had to wade all over the village...and that was often impossible during the storm, and difficult afterwards. With Facebook we can share photos and videos posted by dozens of friends and neighbors. Our readers may have noticed that I (Philip) write this blog, and my daughter (Amy) posts on Facebook. Our blog continues to be a source for short articles about island history, culture, and traditions. We share longer articles and stories in our monthly newsletter. The Village Craftsmen Facebook page is your best source for up-to-date and more comprehensive news, especially about storms and hurricanes. We hope you will follow them all. Karen Lovejoy just shared these two photos of roads near Silver Lake. The tide is coming in, but still not very windy. No tide yet on Lawton Lane, or in front of Village Craftsmen on Howard Street. 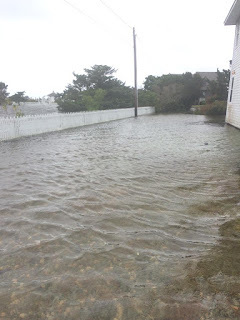 It started to rain a few minutes ago, and there is a bit of a breeze (probably 20-25 mph), but I haven't seen any rising water in my neighborhood. Cars are parked on higher ground "just in case." I'm hoping we don't have to add any new signs to this! It is easiest to post up-to-date storm news on our Facebook page, so check there periodically for the latest information. But we will continue to post here on our blog also, just not as frequently. Hurricane Maria is not forecast to make a direct hit on the Outer Banks, but islanders are preparing nevertheless. 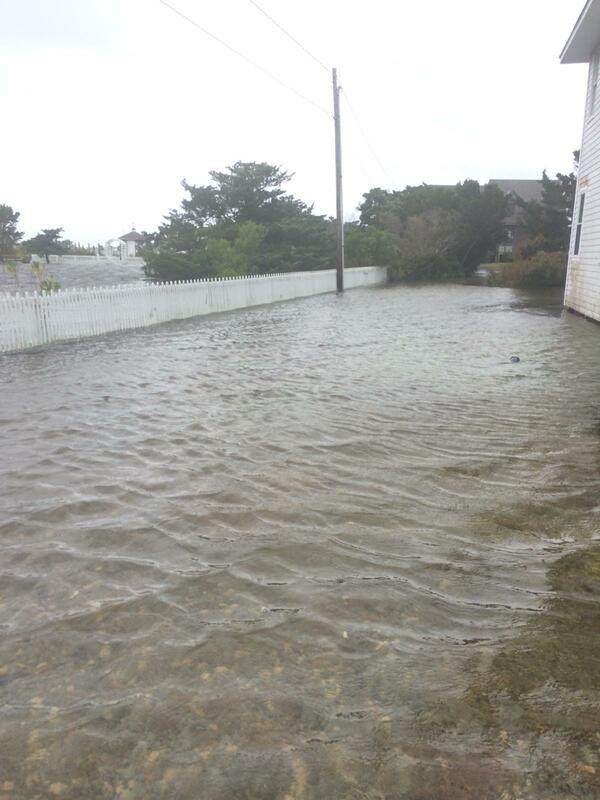 We are expecting tropical storm force winds and higher than normal tides. Cars are already parked on every bit of higher turf. We have been fooled too many times in recent years. I took this photo about 3:30 this afternoon at the airport ramp. The tide was ebbing! As of 5 am this morning Ocracoke is under a mandatory evacuation order for visitors because of approaching hurricane Maria which is expected to brush the Outer Banks with tropical storm force winds, heavy surf, some coastal flooding, and rip currents. Also look for more posts later today and in the next few days. 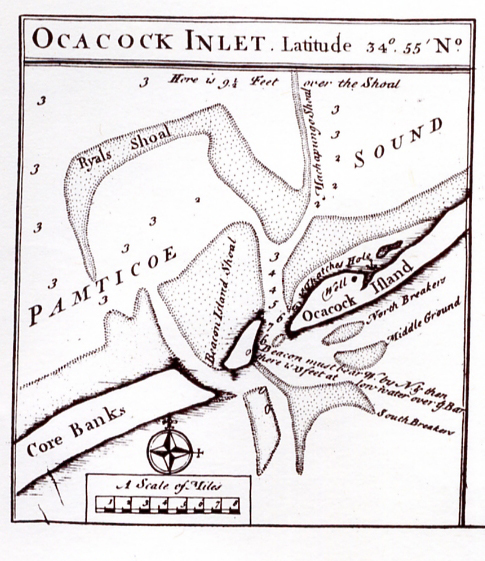 The following 1733 map shows Ocacock Inlet and Ocacock Island. If you look carefully just above the "k" of "Ocacock Island" you will notice the word "well." Although wind and tide have reshaped Ocracoke Island over the intervening years, various people have speculated that this well was located in the vicinity of present day Springer's Point. As it turns out the brick structure pictured below, now fitted with a heavy wooden cover, can be found at Springr's Point. 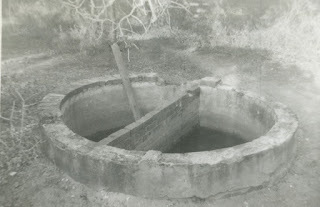 Some people have theorized that this is the exact location of the old well. Although I have never probed the depths of the structure, I always assumed it was an enclosed tank, or drinking water cistern, with a solid bottom, not a well. 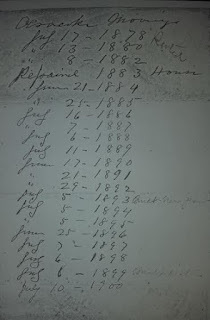 The following document, a series of dates and notes (from 1878 to 1900) jotted down on the back of an envelope by E. D. Springer, should settle the matter. 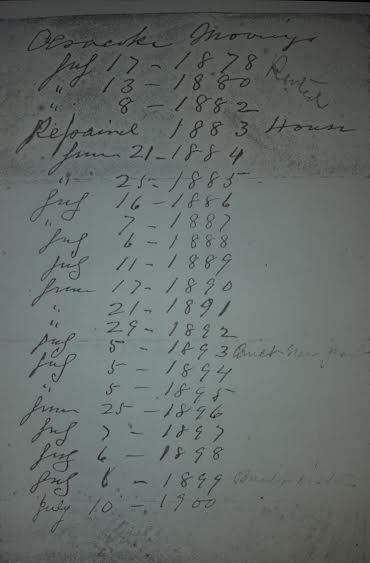 Although it is difficult to make out from the photo, a notation entered after July 8, 1899, clearly reads "built cistern." So, the brick structure at Springer's Point is a water cistern. But where was the well? We will probably never know for sure, but it may have been located on Springer's Point as well. This month's Ocracoke Newsletter is a look at several noteworthy stairways in historic island homes. You can read the Newsletter, and see more photos, here: www.villagecraftsmen.com/news092117.htm. 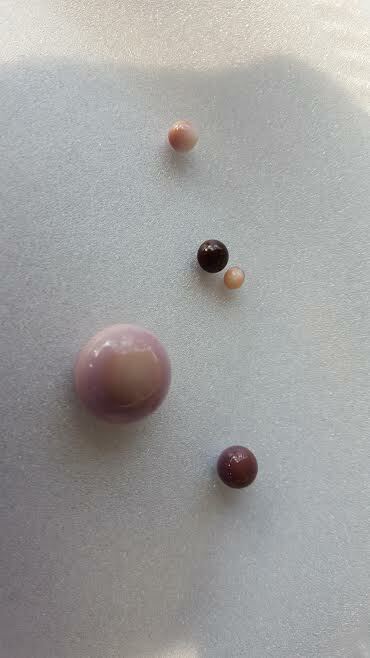 I did not measure the pearls when I took the photo, but I am guessing the largest one was close to one centimeter in diameter. 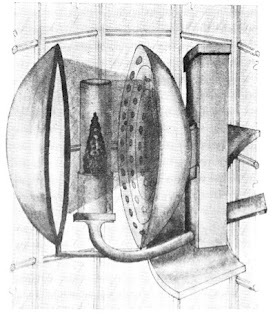 Yesterday I wrote about Winslow Lewis' reflecting-illuminating lamps that were installed in the Ocracoke Lighthouse in 1823. These were used in spite of their inferiority to the Fresnel Lens which was invented in 1822 by French physicist Augustin Fresnel. The Fresnel Lens was a technological leap in lighthouse lighting. With a precise arrangement of glass bull's-eyes and prisms the light was concentrated into parallel rays that produced a much brighter beam from a single light source. 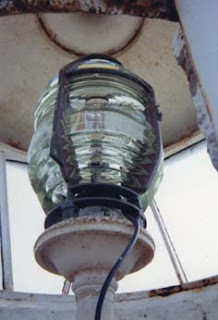 In 1854 the Winslow Lamps in the Ocracoke Lighthouse were replaced with a fourth order Fresnel Lens. There are six orders of Fresnel Lenses, based on their size and focal length. First order lenses are the largest. When the Ocracoke Lighthouse was built, in 1823, it was fitted with fifteen Argand lamps and an equal number of parabolic reflectors and glass magnifying lenses. This arrangement was the creation of Winslow Lewis, a New England sea captain, engineer, and inventor. The drawing above shows the Argand Lamp in the center. The Argand Lamp (invented by Swiss-born physicist Aime Argand in 1782) used a circular wick placed between two thin concentric brass tubes, and enclosed within a glass chimney. To the right is the thin, silver-plated copper reflector. On the left is the lens. A reservoir to hold the oil is situated behind the reflector. Unfortunately, Lewis' parabolic reflectors tended to warp, resulting in a spherical shape. And the lenses were quickly covered with soot, greatly reducing the luminosity. In 1849 ten lamps and twenty-one reflectors replaced the original apparatus. 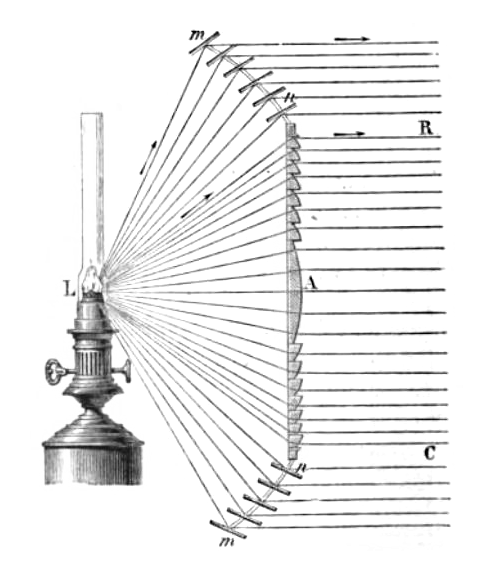 In was not until 1854 that a much more efficient fourth order Fresnel Lamp replaced the original reflecting-illuminating lamps. In his book, Legends of the Outer Banks, Charles Whedbee opens his chapter on a famous North Carolina dolphin (also called a porpoise on the Outer Banks), with these words: "For as many years as there have been deep water sailors, man has been fascinated by and strangely drawn to porpoises." 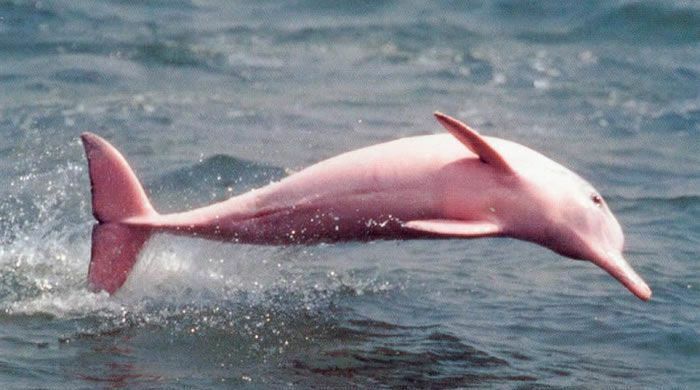 According to legend, in the late 18th century a remarkable albino dolphin made it a point to greet sailing ships as they approached Hatteras Inlet. Captains soon discovered that the dolphin was poised to guide their ships through the inlet, making sure to navigate in the deeper channels and to avoid the sand bars that made the inlet so treacherous. You can read a condensed version of the legend here: http://nclegends.weebly.com/hatteras-jack.html. In April, 1753, a bill "appointing and laying out a Town on Core Banks, near Ocacock [Ocracoke] Inlet, in Carteret County" passed in the North Carolina colonial assembly. "The town, Portsmouth Village, was established as a transfer and storage site for goods passing through Ocracoke Inlet. A fifty acre plot of land was divided into half acre lots. The town was named after Portsmouth, England." The above two paragraphs come from a National Park Service web page documenting the history of Portsmouth Village. 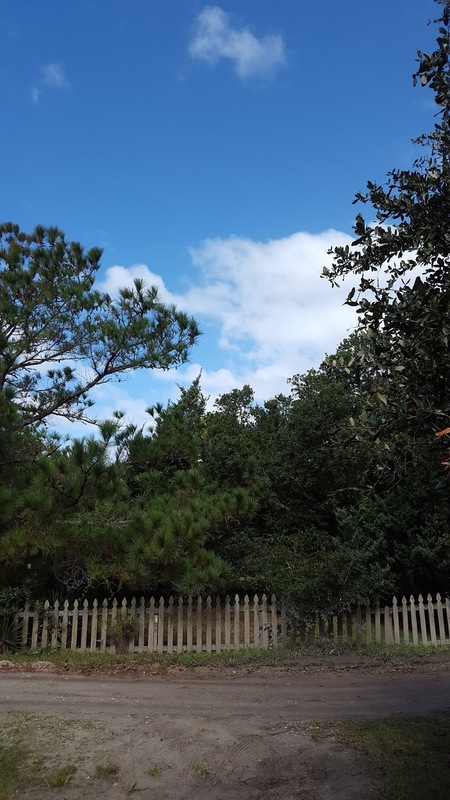 From artifacts indicating that the North Carolina coast was inhabited as early as 3,800 years ago, to the restoration of the Henry Pigott house in 2012, the web page documents the historic timeline of Portsmouth Village. 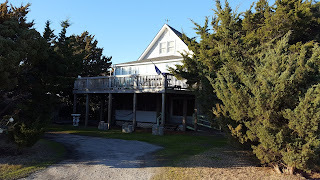 In March, 2016, I published a blog post about Frank Treat Fulcher, with a link to a 2011 Ocracoke Newsletter of his autobiography. 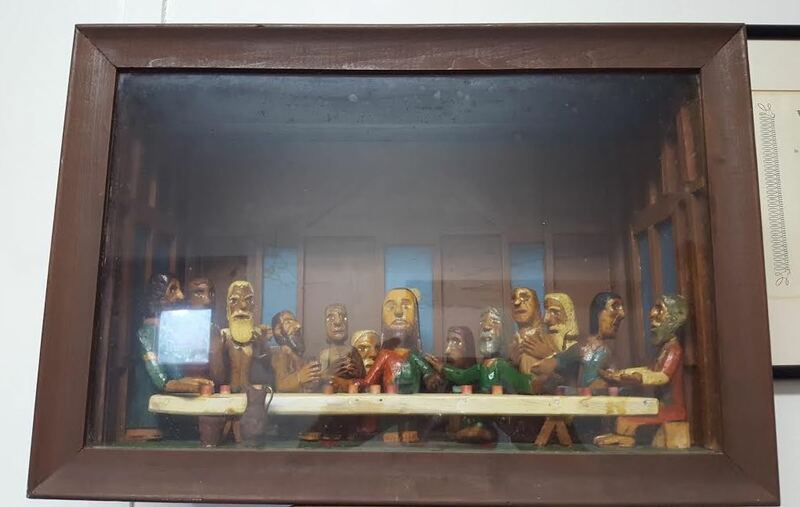 The carving is worth noticing. If the current pastor is in his office I'm sure he would be happy for you to step inside and take a look. In the past I have written about Old Quawk's Day (you can read about that here). Old Quawk is remembered in the names of several places on Ocracoke Island, especially Quawk's Point (also known as Quokes Point, Quork's Point, and several other variations in spelling), and Quawk's Creek (the road sign, now gone, said Old Quoke's Creek if I am not mistaken). There is also Quawk Hammock. "Actually the name is a derivation of the spelling of the word quaking. A low wet marsh or hummock (hammock) is sometime referred to as a quaking hammock or a quake hammock. some sources indicate that if the marsh contains certain species of grass whose spikelets make a rattling or quaking noise in the wind, it is known as a quaking hammock. A quaking or quake hammock may also have its origin from the Middle English term quaghe which eventually meant quag or quake and referred to wet low marshes. The term quaking bog is a common reference in fourteenth and fifteenth century England." 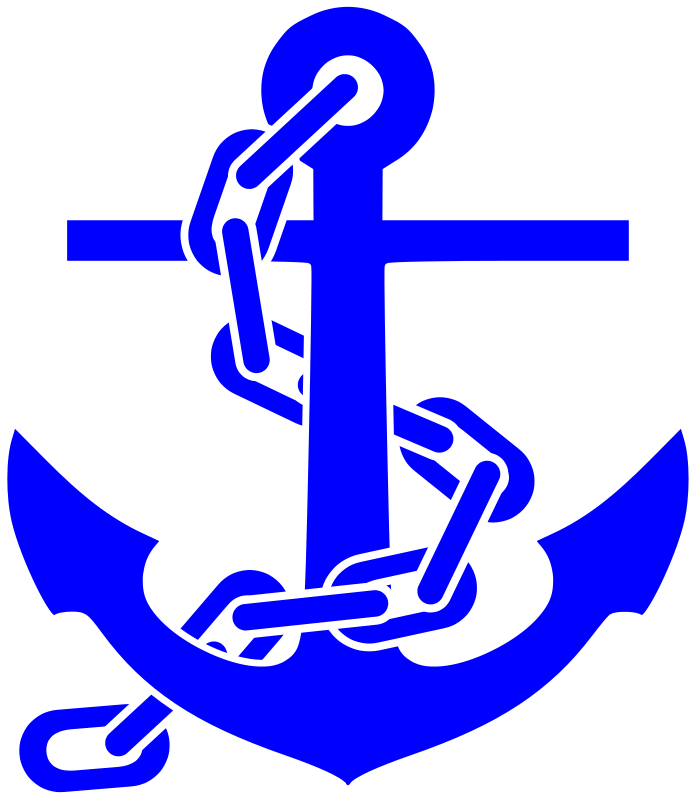 The Women's National Relief Association was also called the Blue Anchor Society. You can read more here: http://northcarolinashipwrecks.blogspot.com/2012/06/womens-national-relief-association-blue.html. 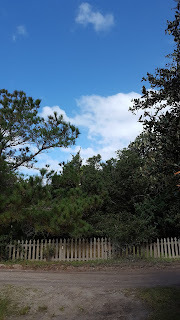 In the past I have written about Outer Banks and Ocracoke Island windmills (http://www.villagecraftsmen.com/news012113.htm). 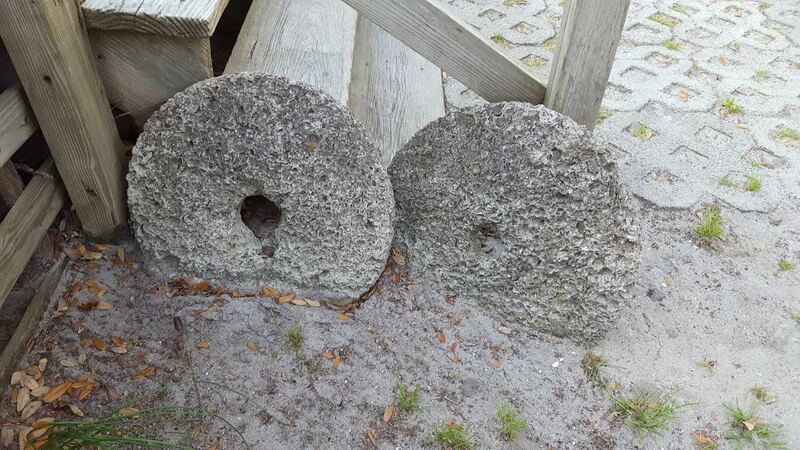 One large millstone (along with an accompanying photo) is on display in the yard of the Preservation Museum. Not long ago a neighbor directed me to these two smaller millstones in the yard of a descendant of one of the island's 19th century millers. Fish were often carried from Ocracoke to the mainland and traded for corn. Then the corn was ground on the island and sold in the village. 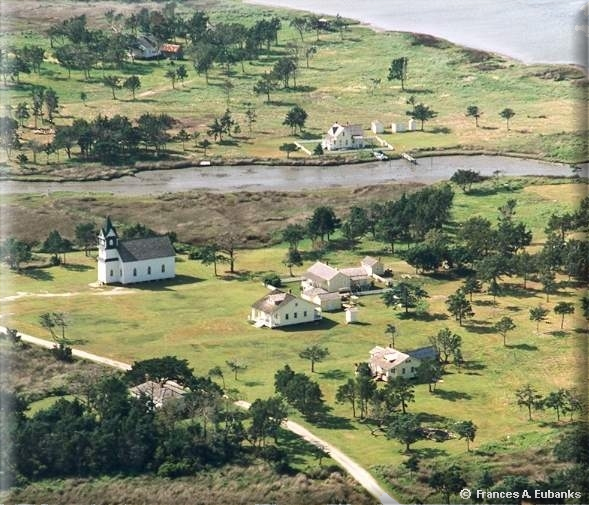 As Alton Ballance writes in his book, Ocracokers, "for many periods in its history, Ocracoke had no doctor. Over the years a number of doctors have come here, perhaps staying for a few years or less, but until recently none actually settled here to practice. 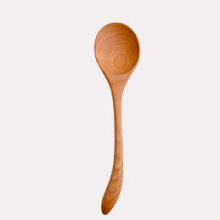 So Ocracokers learned to take care of their sick or injured themselves, using home remedies and relying on the wisdom and experience of the old people." 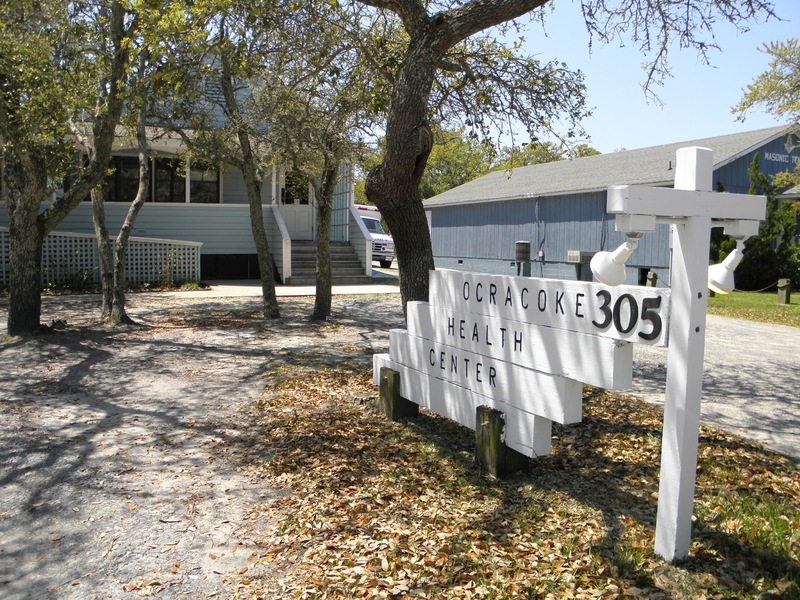 In addition, several midwives served the island over the years, and two nurses, Kathleen Bragg and Elsie Ballance Garrish, were notable caregivers on Ocracoke. Beginning in the mid-1960s Dr. F. Danford Burroughs of the newly completed Hatteras Medical Center treated many Ocracoke islanders, although that required a ferry ride to Hatteras. In the summer of 1981 Warren Silverman, M.D. moved to Ocracoke after four decades without a doctor. Dr. Silverman's wife, Jean, a nurse, accompanied him. They practiced from their home until the island's new Health Center was completed the following year. Dr. Silverman also made house calls. Today Dr. Erin Baker is the island's resident physician. She practices in the Ocracoke Health Center on the Back Road. In addition, Dr. John T. Kihm makes monthly trips to the island from Durham, where he lives and practices medicine. 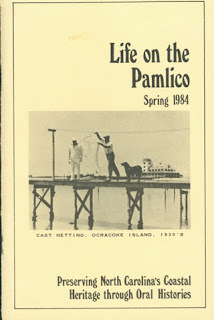 In a 1985 article by Pat Brown for Life on the Pamlico (http://circanceast.beaufortccc.edu/BCCC/lifeonpamlico.htm), a publication of Beaufort County Community College, Pat Brown interviews John A. Wilkinson, “attorney and man for all seasons” (http://circanceast.beaufortccc.edu/BCCC/articles/Summer1985/PDF/Story2.pdf). The interview begins with Brown presenting Wilkinson with a complimentary copy of the Spring, 1984, issue of Life on the Pamlico. 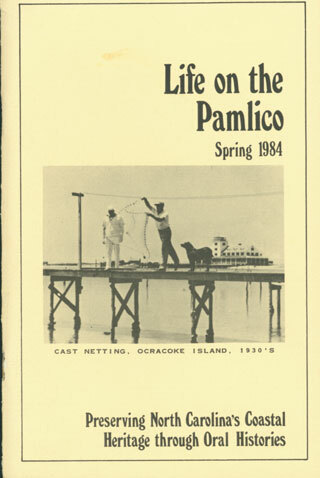 The cover photo (from the 1930s) shows Stanley Wahab of Ocracoke, another man, and a dog standing on an Ocracoke Island pier. Wilkinson immediately comments: The dog I knew. Pat Brown: Is that right? John W. McWilliams, Democrat, of Hyde County, Ocracoke, N.C., March 10, 1869. Son of John S. and Eliza (Farrow) McWilliams. Educated at the public and private schools of Ocracoke, 1876-1885. Merchant. Commissioner of Wrecks for Hyde County since 1905. Nominated clerk of Superior Court of Hyde County in 1906, but declined to serve. Representative in General Assembly from Hyde County, 1909, 1911. 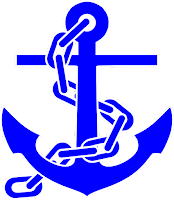 Fraternal orders: Masons, I.O.O.F. Served as Noble Grand five terms; Treasurer since 1904. Methodist. Married, in 1889. Miss Elizabeth Williams. Three children. Address: Ocracoke, N.C.
One of the largest general stores on Ocracoke was that established by John W. McWilliams in the late 1800s. 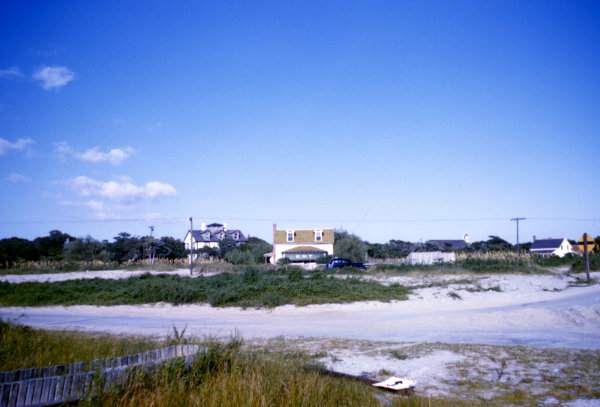 Located down point, on the shore of Cockle Creek, with a view of the harbor from one side, and the lighthouse from the other, the "Department Store," as it came to be called, included several structures joined together. McWilliams traded in groceries, boating supplies, hardware, clothing, and other general merchandise. He even carried a line of furniture. A barber shop sat across the lane. The fierce storm of 1933 did considerable damage to the store, and sometime after John McWilliams’ death the store was abandoned." 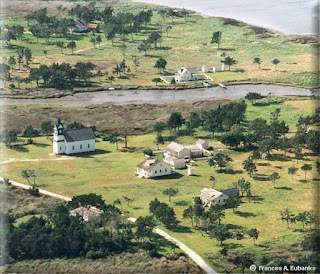 A number of people living on Ocracoke today are direct descendants of John W. McWilliams. I wonder how many of our readers remember Black Anchor Antiques. This small business was owned and operated by Darrell Bell Dudley and his wife Sallyanne. Darrell was born on Ocracoke in 1933. He was the son of the late Claude and Annie O’Neal Dudley, and had homes in Ocracoke and Elizabeth City, NC. 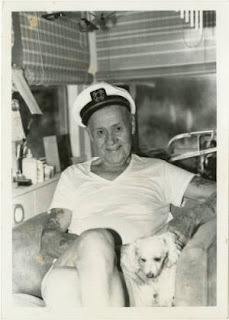 He died in 2007 at his home in Ocracoke. In addition to operating Black Anchor Antiques & Collectibles, Darrel was a clock repairman. He and his brother, Ronald, donated a pendulum clock to one of Ocracoke's local non-profit organizations. 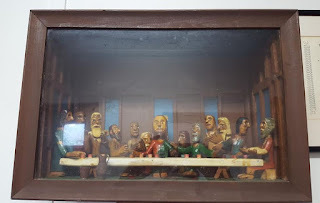 He was also a member of the Ocracoke Masonic Lodge. I could not locate any photos of the Black Anchor Antiques shop, but I recently took this photo of the building where it was located. It is now a private cottage. Do any of our readers know where this building is located...and can anyone remember what other businesses or organizations have used it? Some of our readers will remember William Bryant (Willie) Hunnings (1913-2000). Willie was the son of Winfield Hunnings and Ocracoke native Myra Garrish. Willie was not born on Ocracoke Island, but moved here with his mother and step-father, Jather (Jake) Alligood, about 1930. Willie, who was seldom without his trademark white yachting cap, worked painting houses in the 1950s and 1960s. You could also often find him behind the counter of the Community Store. His friendly, pleasant personality made shopping there a genuine pleasure. Willie enjoyed music, and often sang while he worked. He also played harmonica for the old island Graveyard Band. 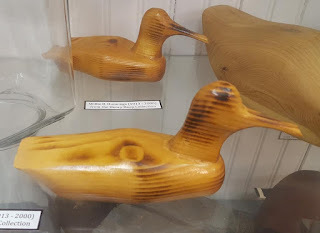 In the 1970s and 1980s you could usually find Willie (sometimes called "Three Fingers"...no one could ever tell me how he lost his fingers) in his workshop carving birds or sailing ships. Willie was the grandson of Epherena Fulcher Garrish (click here for her story).